I was reading this article on NPR’s website today and found this really interesting. 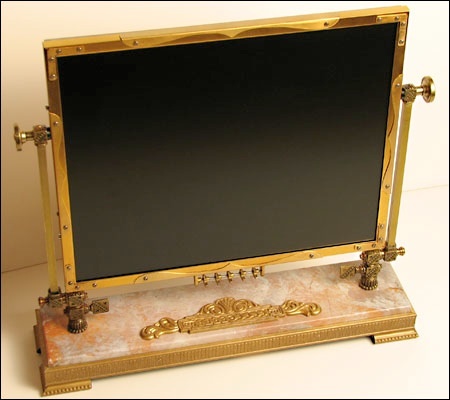 It deals with an artist that is “steampunking” computer monitors, keyboards, and other technological gadgets with brass fittings, leather casings, and Victorian finishes. Think Steve Jobs meets Jules Verne or something that you would see in a 1930’s science fiction movie. It is an interesting response to the sleek, minimalistic designs of today, however I am not sure how practical it would be typing away on one of his keyboards. Definitely would look nice on one’s desk than a beige hunk of plastic. If you are interested in seeing more of these creations, visit The Steampunk Workshop. « Just so crazy, it might just work . . .